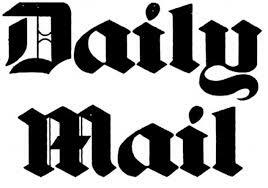 Connecting Businesses & Entrepreneurs to UK Journalists & Media Who Are Looking For Help With Expert Comments, Stories & Articles. Get help with current stories, articles and expert comments. Connecting you UK Business Owners & Entrepreneurs waiting for your request. Following the success of our Meet The Journalists we are looking to work with ongoing Journalists across all media outlets and sectors. Find out more and register your interest. 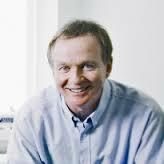 Interested In Articles, Stories & Expert Comments? Opt in to receive ongoing relevant articles, stories and expert comments. Where Journalists can search for UK experts within seconds. Search by region, expertise, sector. Coming soon. Connecting The UK Media & Journalists To Businesses & Entrepreneurs. BlueBoo is dedicated to helping you secure publicity for your business. 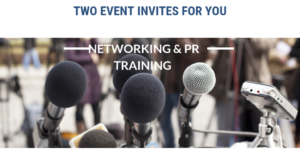 It’s PR made simple, we train and inspire you, and we bring the media to you! Show you ‘How to do your own PR’ with a step by step guide and PR tool kit. 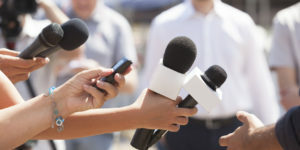 Inspire and empower you to connect to the Journalists, Producers, Editors etc with our publicity coaching and media training interviews. Connect you to the media directly with daily PR leads delivered to your inbox. Give you unlimited access to UK Journalists, Editors, Bloggers and Media Outlets such as TV, Radio & Press with full contact details to send press releases and emails with your own media database. 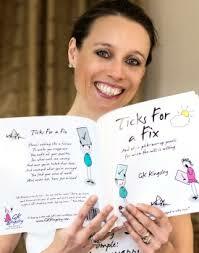 BlueBoo’s Founder and CEO is Rachael Taplin. She is a well-known businesswoman and entrepreneur; her determination is commended and respected at the highest levels and she has recently been recognised as one of the top 50 UK Inspirational Women in the UK. 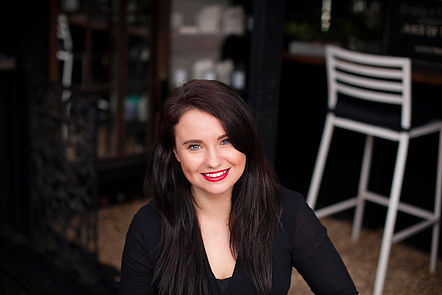 She now dedicates her time as The Media Match Maker, training and helping entrepreneurs and business owners to be inspired to use PR and secure publicity for themselves whilst also connecting them direct to the UK media and journalists. 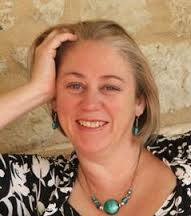 Rachael has achieved her own personal media exposure within local, regional and national press, on radio and TV, she has also appeared within most of the national glossy magazines and has worked with lots of well know celebrities, so it’s safe to say she knows what’s she’s talking about. From one press release Rachael appeared on over 70 radio stations in one day and was also featured in one the UK’s largest daily newspapers. 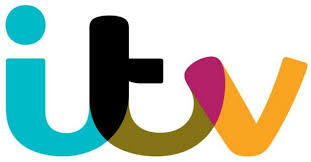 She has helped and inspired thousands of UK business owners to secure publicity both online and off line including TV, Radio and Naitonal Press. 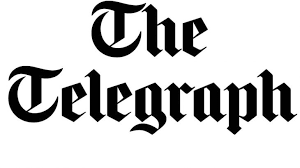 One recent tip Rachael shared with her client secured them a double page spread in the Times with a value of over £100 000. 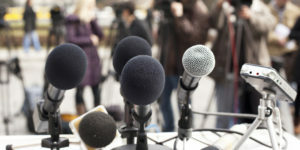 Club100 will educate & inspire you for PR success PLUS get connected to up to 70k journalists. Join as a founder member with pre-launch media platform access. Register your free profile and get access to our private Facebook group. Upload your blogs, articles and expert comments and secure ongoing publicity. Get access to interviews with journalists, editors, producers, influencers and bloggers and find out the exact steps you can take to secure publicity across TV, radio, print etc. 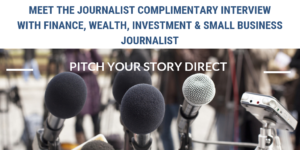 Pitch your story to the right people and build meaningful relationships with journalists and influencers in your industry. Targeting media contacts and outlets has never been easier. I love the tight targeting of the media database, you can look for freelance journalist who specifically work in a certain sector or you can look at lifestyle magazines for instance. What is so powerful is that it's not just an email address it's their Twitter accounts and we all know that this is a great place for connecting with journalists. When you can be so specific on who you are targeting the ease of it is mind blowing. Within 20 minutes of joining the media database I went as soon as I signed up and linked with some of the journalists on Twitter. I saw a journalist tweet asking for women to help with the national article that absolutely fit it for me. I contacted her and she is proposing to write an article about me in the Daily Mail, thank you BlueBoo the Media Database has delivered within 24 hours of joining. Within a week of signing up to the media database I sent out a press release suggesting a story idea to targeted journalists. I had a good response, first was from the editor and chief from a luxury men's magazine who is our absolute target market, we scheduled in an hour's telephone interview, it was that simple. I also had a response from a lady who is the editor for a Bridal Magazine, I answered her questions for an article and she has also asked to be a regular contributor for her national magazine. Great investment. 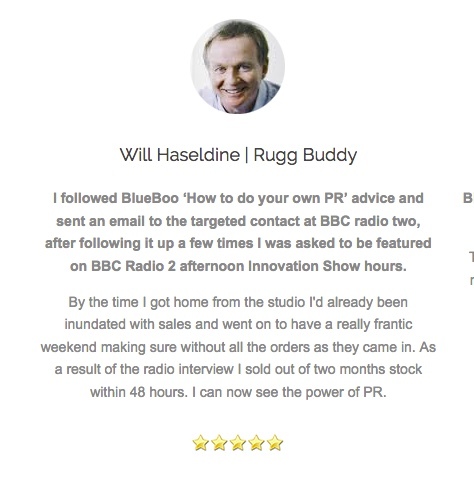 I followed BlueBoo ‘How to do your own PR’ advice and sent an email to the targeted contact at BBC radio two, after following it up a few times I was asked to be featured on BBC Radio 2 afternoon Innovation Show hours. By the time I got home from the studio I'd already been inundated with sales and went on to have a really frantic weekend making sure without all the orders as they came in. As a result of the radio interview I sold out of two months stock within 48 hours. I can now see the power of PR. BlueBoo advice has got my business into print media a few times. These including a series of monthly articles in mainstream UK magazines with 60,000 meant to print run. Highly recommend Rachael and BlueBoo. Within 24 hours of joining BlueBoo and following the How to do your own PR advice I secured a radio interview which then lead on to a TV opportunity. It's like anything, there is no point going through trial and error and reinventing the wheel, if you can have someone show you exactly how to do it, you're saving a lot of time hassle and heartache. It's the quickest route to getting something done, so I just needed the ‘how to do it’. It also confidence, it's not knowing if you are doing it right, so if you can be taught your confidence goes through the roof. So when it comes to talking to the reporters in front of the camera or on the phone to give an article you're so much more confident. 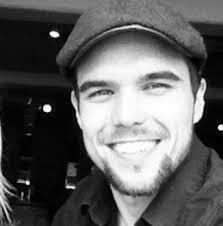 I secured my own column within three days of signing up to daily PR leads. I saw two media requests I liked the look off, both for online media asking for ideas, I emailed them both and suggested ideas then I had the idea of writing a comment and pitched that, they both agreed and offered me a regular column which is been great to promote my book and website. To be honest when I joined on Monday I thought I would give it a go for a month and probably not going to get anything and then three days later I have two magazines that want me to provide them with regular articles. Thank you, love the daily PR Leads. Massive thank you to BlueBoo for the PR Leads, there was one on there that just sounded fun and I match the criteria, so I contacted the Journalist by Twitter and after two tweets and an email I've secured a fabulous fun article. Truly grateful for your gift and support, the journalist was really grateful that I contacted her so gratitude all round and it only took me about 15 minutes in total, will share the peace when it's published. If you are thinking of working with BlueBoo, absolutely go for it! It is so so worth while, and the fact you inspire us and show us ‘How to do your own PR’, is so helpful. If you are thinking of working with BlueBoo, absolutely go for it! It is so so worth while, and the fact you inspire us and show us ‘How to do your own PR’, is so helpful. and the advice and knowledge you give is brilliant. I have secured a double page spread and also now been asked to be a regular contributor. Within hours of being inspired by BlueBoo and following their advice, I sent out a press release, I had a phone call asking me to be on BBC Radio, I can't believe how fast it happened actually. I joined the Media Database only a couple of weeks ago, sent out a press release and within a few hours had a phone call from Sussex radio asking me if I can be interviewed in the afternoon, it was just unbelievably fast. I've also got another request in my email box as well so it's just incredible results in an incredibly fast time.